Alberta May was doing what most people dream of doing on a 7 a.m. flight – closing her eyes for a bit and catching a nap. But this particular early Tuesday morning flight – American Airlines Flight 761 from Dallas to Phoenix – had other plans for her. “One of the flight attendants came across the intercom and asked if there was any medical staff on the flight,” fellow passenger Garth Adams said. One of the passengers, who was pregnant, looked pale. May, who happens to be a labor and delivery nurse, quickly made her way to the woman’s side. “She was 20 weeks pregnant and was having shortness of breath and a pain in her chest. I think she was a little nervous,” said May, a 5-foot-tall nurse from Marshall, Texas, with a beam-bright smile who was at Grand Canyon University Arena – her final destination that day – after her harried morning. Unimaginably, about 15 minutes later, May was called to another area of the plane, where another passenger was having a seizure. She gave a reassuring look to her first patient then made her way to the flight’s second medical situation. May was not nervous about the dual emergencies; she is a nurse, after all. 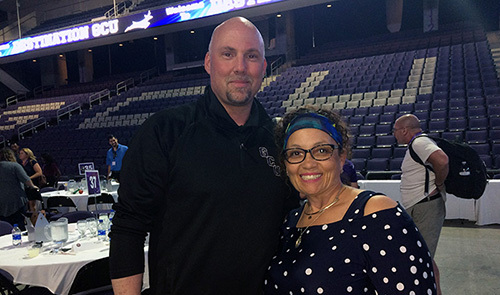 An unscheduled stop in Albuquerque, N.M. – both passengers were taken off the flight for further treatment – didn’t deter May from making it to the GCU campus, where she was scheduled to take part in Destination GCU, a day trip for GCU online students to introduce them to advisors, familiarize them with the campus and make them feel more connected to the University. 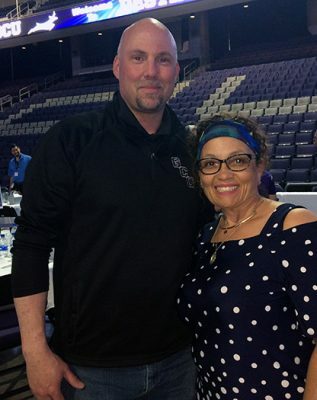 It also was the destination for Adams, a Dallas area-based university development counselor who accompanies online students to campus for Destination GCU events. Adams said he has been through everything as an airplane passenger – lightning, turbulence, you name it. But two medical situations just minutes apart? “In the 42 years that I’ve flown, I’d never come across anything like it,” he said. He said when he was waiting to catch the shuttle from the airport to GCU, he recognized May. They shared the shuttle van to the University. He had to say something to her – to thank her for what she did, apropos considering that it’s National Nurses Week. While many students visit the campus for Destination GCU before they start their online coursework, May already was two weeks into her studies for a bachelor’s degree in nursing. Christus Good Shepherd Medical Center in Marshall, where May worked, closed its labor and delivery department in March, transitioning its mother/baby services to the hospital’s Longview, Texas, location. That’s when she decided to further her education and earn her BSN. May wanted to work in the medical field as far back as high school, originally seeking to become a pediatrician. “I actually worked through high school. I did health occupations,” she said. She returned to school in 1983 to become a licensed vocational nurse, earned her associate’s degree in nursing in 1997 and has worked in just about every nursing unit. “I just love being able to help,” she said. She loves taking care of people. Thinking back to that American Airlines flight, May, who is the mother of five children and grandmother to 15, said her maternal instincts just kicked in. “I would hope someone would treat my daughter the same way,” she said. May said she loved her visit to GCU. About six hours after arriving in Phoenix, and after that not-so-smooth flight, May was headed back to the airport for the flight home. Maybe she could rest her eyes a bit longer this time around.